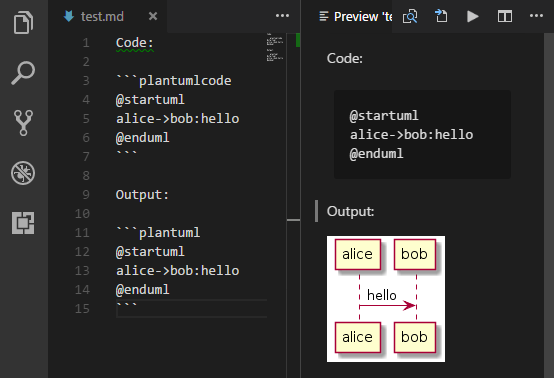 Visual Studio Code>Programming Languages>PlantUMLNew to Visual Studio Code? Get it now. 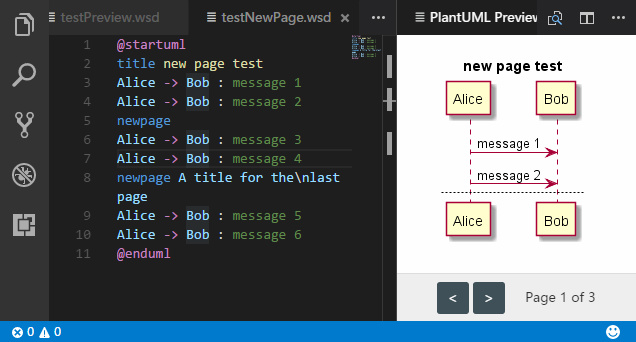 Rich PlantUML support for Visual Studio Code. Latest version has changed the include files search logic, using diagramsRoot as base directory, which makes including path consistent across all files in workspace folder. To new projects, it's recommended to use default setting, since it's more easy to manage. Get 15X times faster export by utilizing PlantUML Server as render. How to? Basic auto completion & macro signature support NEW!! Extracting source from images support. Depend on which render you choose, plugin has diffrerent requirements. A plantuml server. See Use PlantUML Server as render. Plugin has integrated a copy of "plantuml.jar", you are good to go now. But if you want to use your own jar (maybe a newer version, or with many dependent jars), specify the jar location with setting plantuml.jar. Zoom in / zoom out / toggle buttons of the controls bar. Scroll to most bottom/right/top/left, preview will snap to that border. e.g. Snap to Bottom is useful while writing long activity diagrams, which helps you keep focus in the latest part in the bottom. PlantUML formatter is disabled (since v2.8.3) if editor.formatOnSave is on. Because the formatter is not reliable enough according to user feedbacks. Plugin supports two renders: Local and PlantUMLServer. Local is the default and traditional way. If you care more about export speed, you should try PlantUMLServer. 15X times faster export and much quicker preview response. Don't have to set local enviroments if you have a server in your team. You don't need plantuml.exportConcurrency, because it's unlimited in concurrency. Cannot render very-large diagrams (HTTP 413 error). Cannot render diagrams with !include in it. Less format support: png, svg, txt. Some settings are not applicable: plantuml.jar, plantuml.commandArgs, plantuml.jarArgs. You may already have a PlantUML server in your team, find the server address, like: http://192.168.1.100:8080/plantuml. If don't have one, you can set up on you own (follow the instructions). Find the server address, like: http://localhost:8080/plantuml, or http://192.168.1.100:8080/plantuml which is ready for sharing to your team. 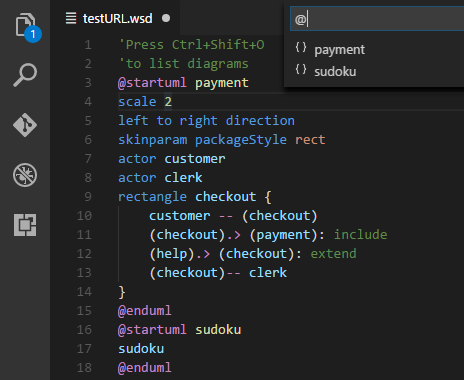 @startuml / @enduml is still recommended, so that PlantUML code in Markdown can be managed by other function of this plugin. This extension contributes the following settings. plantuml.render: Select diagram render for both export and preview. plantuml.server: PlantUML server to generate UML diagrams on-the-fly. plantuml.commandArgs: commandArgs allows you add command arguments to java command, such as -DPLANTUML_LIMIT_SIZE=8192. plantuml.jar: Alternate plantuml.jar location. Leave it blank to use integrated jar. plantuml.jarArgs: jarArgs allows you add arguments to plantuml.jar, such as -config plantuml.config. plantuml.diagramsRoot: Specifies where all diagram files located (releative to workspace folder). 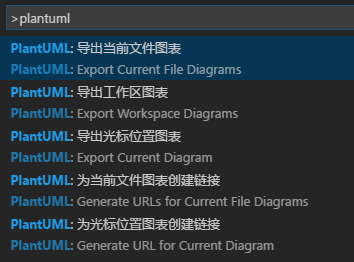 plantuml.exportOutDir: Exported workspace diagrams will be organized in this directory (releative path to workspace folder). plantuml.exportSubFolder: export diagrams to a folder which has same name with host file. plantuml.exportConcurrency: decides concurrency count when export multiple diagrams. plantuml.exportMapFile: Determine whether export image map (.cmapx) file when export.